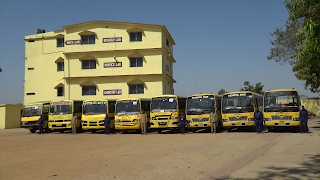 The bus facility will be given for the whole session. The bus pass must be cariied by the students daily. The bus fee should be given well in advance, if failed late fine will be charged accordingly(As per rule). Any student who is reported to the principal for misbehaving in the bus or causing any incovenience to the driver or cleaner in any way liable to be debarred from the bus facility at any point. Due to any sort of mechanical problems etc. bus may not fly for the particular area/date. Bus timing may differ in any sudden disturbance in city/school. For any kind of inconvenience parents are requested to report to the school office, they are not allowed to disturb the bus staff at any cost. Request for the change of address/stoppage will be entertained only from the next month of the session along with proper informations. As per the hike in the price of diesel school management is liable to increase the bus fee even during the session. School will not be responsible for any type of mishappenings during bus travel.